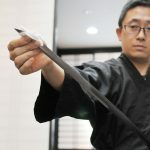 From Shinken to Iaito and decorative wall-hangers, there are numerous types of Japanese swords available for purchase today, however today we will have a look at the only part that you touch on a Katana, the Tsuka and some simple ways to distinguish a good Tsuka from a bad one. 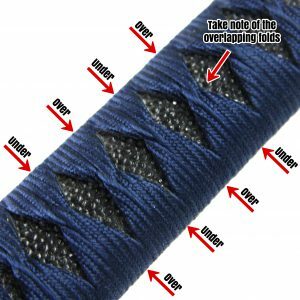 How do you know if a Tsuka is good or bad? Can you see the difference? Point 1. 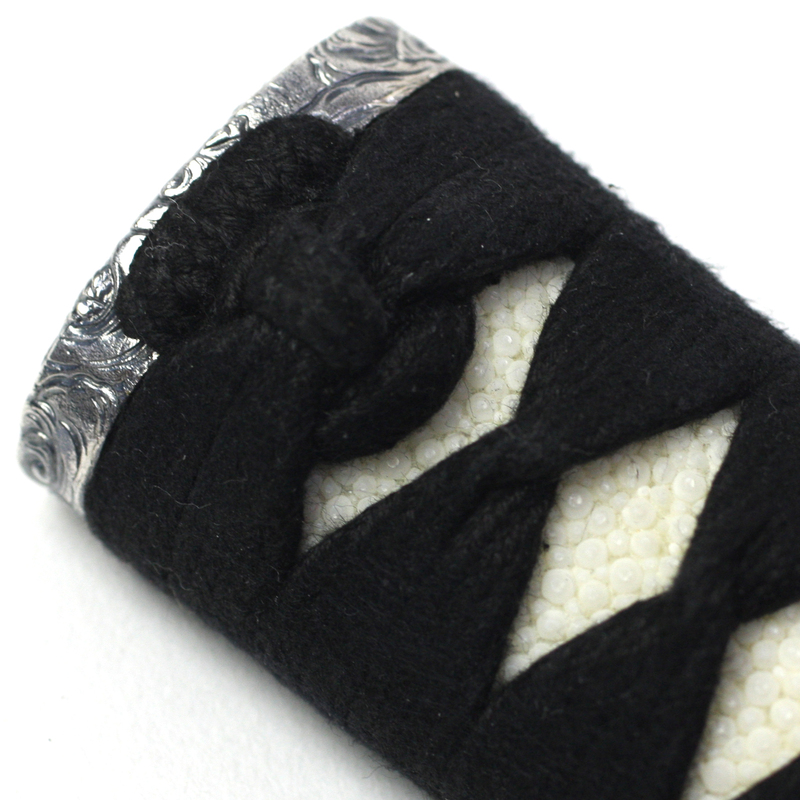 Is the Tsuka-ito wrapped firmly? 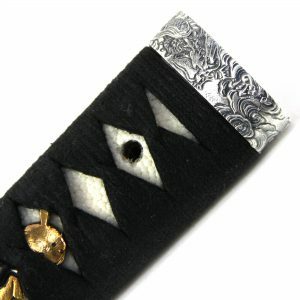 A Tsuka is wrapped with Tsuka-ito, which can be made with fabric string or with leather strings. 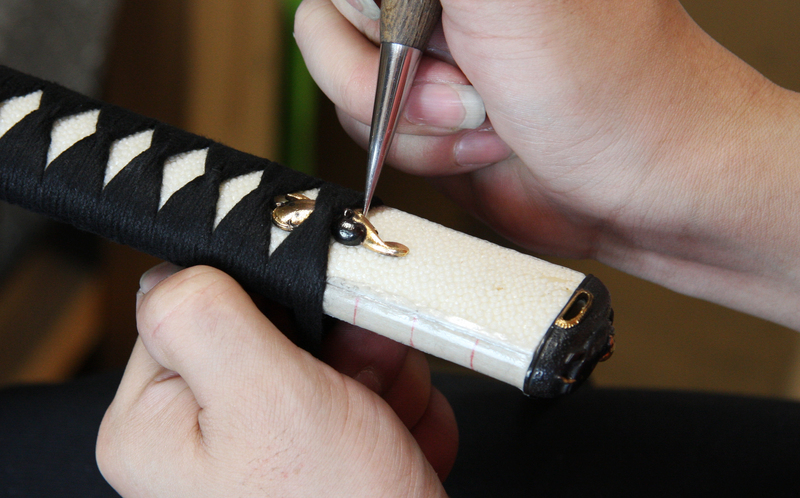 If the Tsuka-ito moves and seems like it will come off only by touching it, you better watch out. 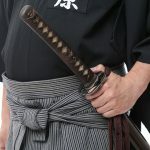 The Tsuka-ito should not be moving if you touch it or try to push/pull it, especially not if the sword is new, although with time the Tsuka-ito might become slightly loose due to wear and tear. 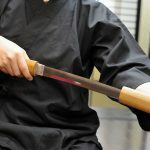 If the Tsuka-ito is not properly wrapped it might result in serious injury or accidents. So please make sure that the Tsuka-ito is properly and firmly wrapped onto the Tsuka. A properly wrapped Tsuka will not have any level difference in-between the Tsuka-ito and the Fuchi/kashira. 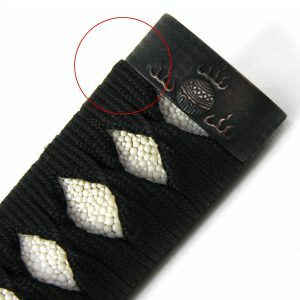 If there is a large bump caused by the Tsuka-ito, it might mean that the Tsuka-ito haven’t been properly stretched when it was wrapped onto the Tsuka. 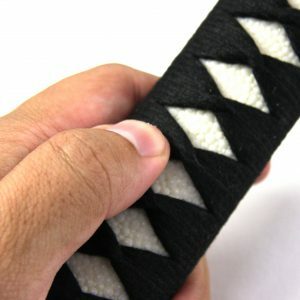 Not only does it look bad, but it also affects the grip when you hold the Tsuka, which is why if you see such a Tsuka, it should be avoided. Point 3. 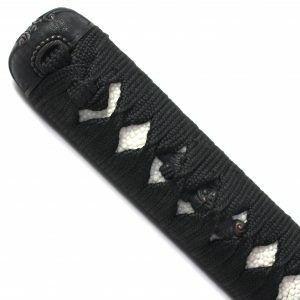 Is the Tsuka properly wrapped so that there is a front and a backside? 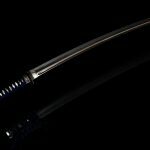 Katana swords has a proper front and back side, called “Sashi-omote”(the “front side” when the sword is sheathed) and “Sashi-ura” (the “back side” when the sword is sheathed). 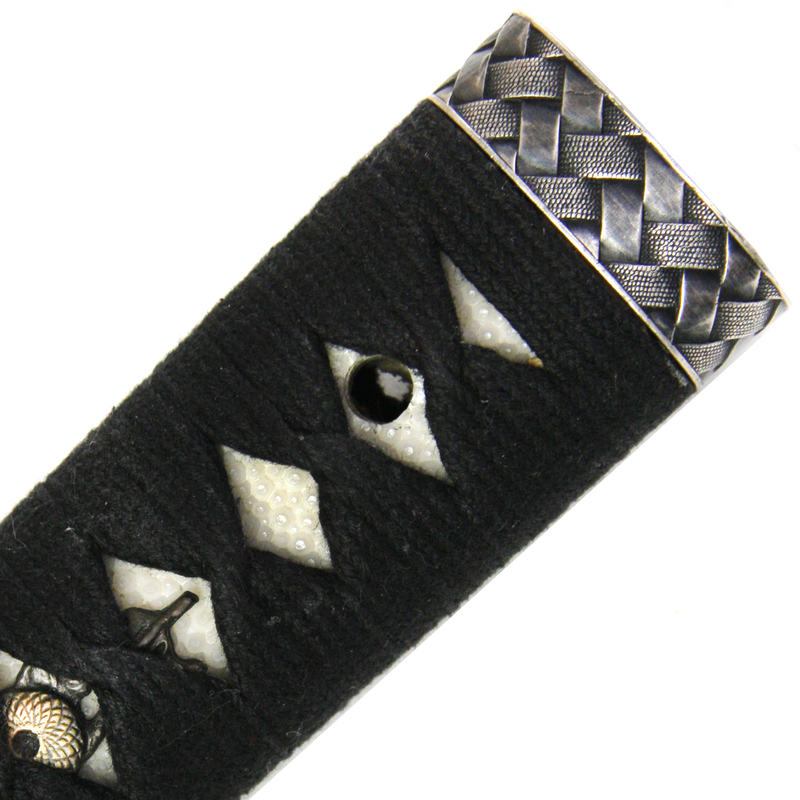 In the art of Tsuka-maki (Tsuka wrapping) there is a rule that says that the wrapping on the front-side must start with an “Ichimonji”, meaning a straight line. 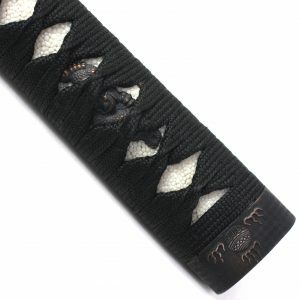 Besides for certain Koryu styles such as the Yagyu-style Tsuka, the front will definitely start with the Tsuka-ito forming a straight line. 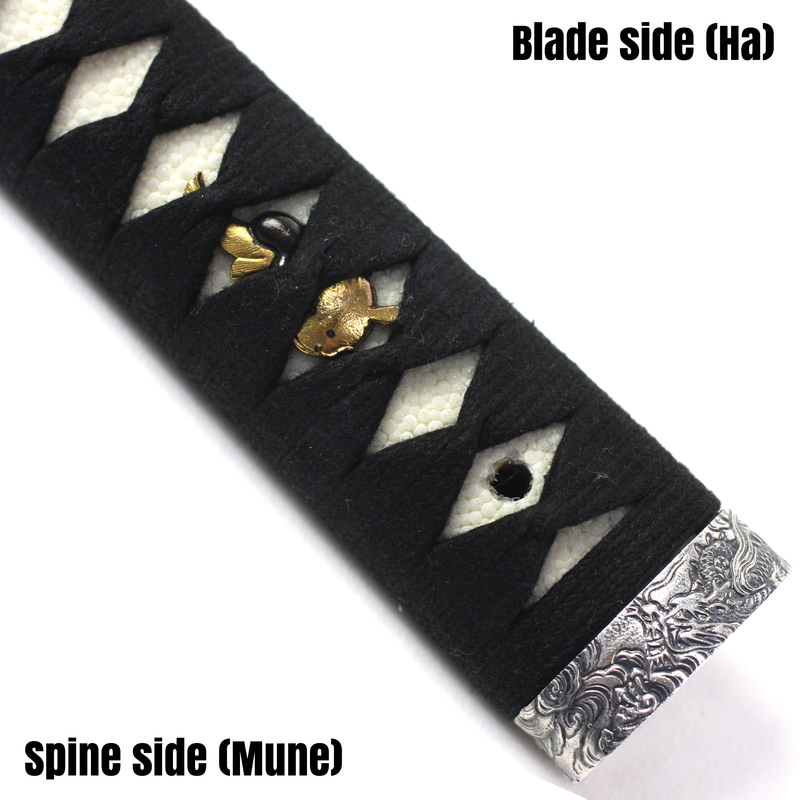 Please note that the Sashi-ura (back side) does not feature this line, if both sides looks like this, or has a straight line, besides in some exceptional cases, then the Tsuka is not properly made! The closing knot works the same way, on the front it’s closed with a “Omote-dome” knot, while the back is closed with a “Ura-dome” knot. 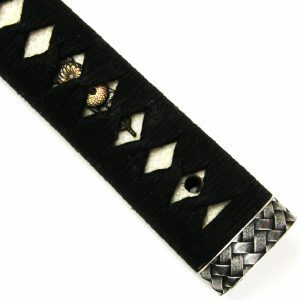 If the closing knot is reversed, and done on the wrong side of the Tsuka, it signifies that the craftsman doesn’t have the appropriate skills for this job. The Sashi-ura will naturally have a Ura-dome knot to close it off, please note that the knots used on the front side and the back side are distinctly different! When wrapping the Tsuka, the Tsuka-ito forms white “diamonds” showing the Tsuka-same below. One of the basic rules of Tsuka wrapping is that the diamonds need to be uniform, this is a sign of the skill of the craftsman who made it. If the shape and size of the diamonds are not uniform, not only does it look amateurishly made, but it also affects the feeling when you grip and use the sword, so please watch out for Tsuka where the diamonds are not uniform. A properly wrapped Tsuka with uniformly formed diamonds along the whole length of the Tsuka. Starting with an Ichimonji and ending with a Omote-dome knot. The Tsuka is wrapped with a single Tsuka-ito, which is supposed to be wrapped while alternating the top and bottom Tsuka-ito at each fold, meaning that if the first diamond fold is wrapped with the left Tsuka-ito on top, on the next diamond fold it should be at the bottom. In some cases you might see Tsuka that are wrapped in the way so that the same Tsuka-ito is always on the top, but beware as this is an incorrectly wrapped Tsuka. 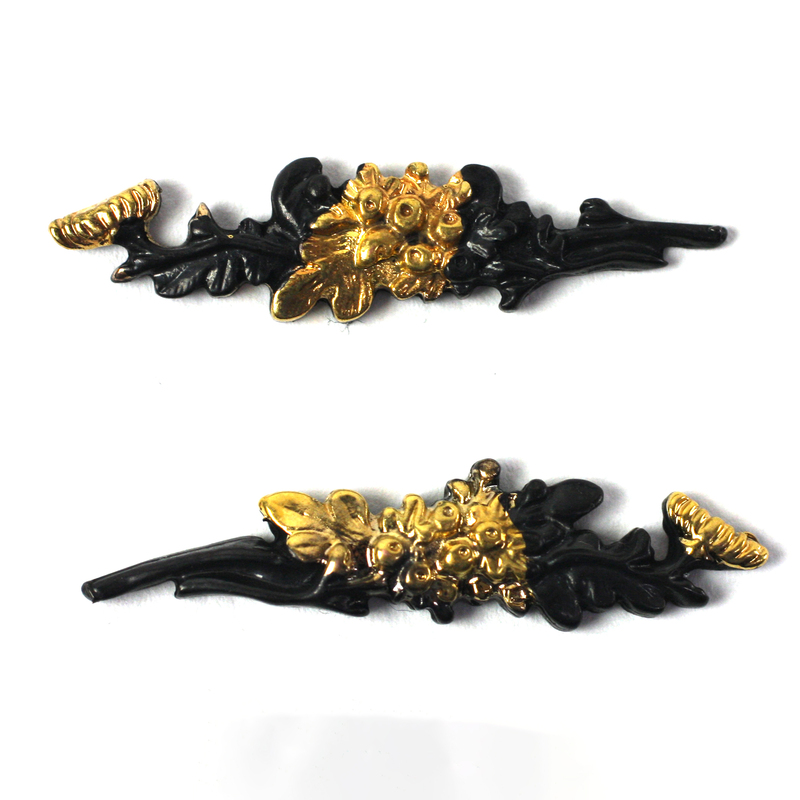 Please compare the pictures below to see the difference. This Tsuka is not only poorly wrapped, with the diamonds being in disarray, but the Tsuka-ito was not wrapped while alternating the top and bottom Tsuka-ito at each fold either, as you can see, the same Tsuka-ito is always on top/bottom, which will cause the Tsuka-ito to unravel very easily if it’s cut. 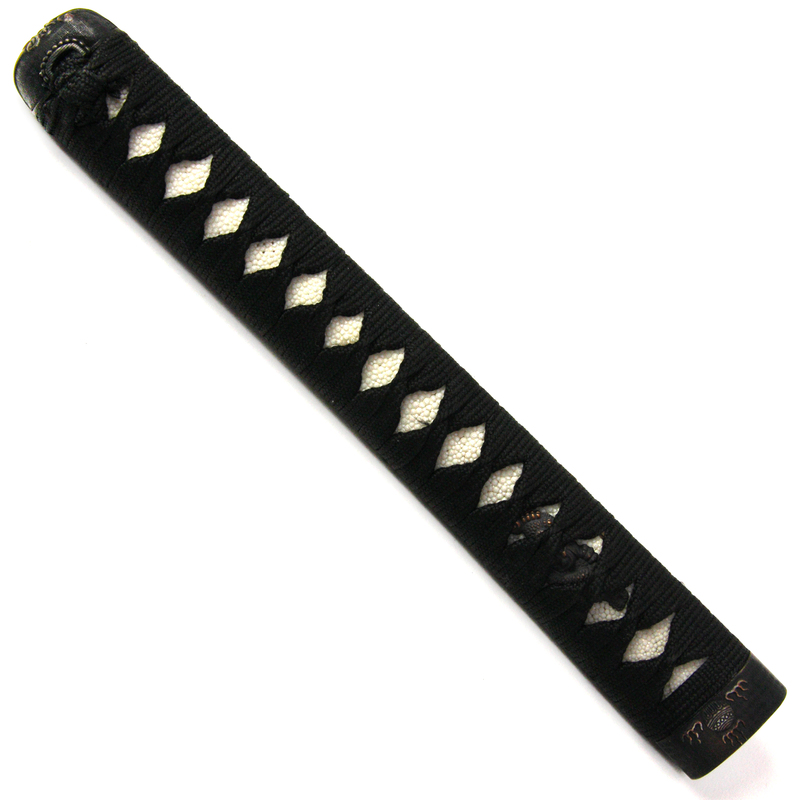 The historical reason the Tsuka-ito is folded alternatively at each diamond fold is to prevent the Tsuka-ito from unraveling in the case you happened to receive the blade of your opponent with your Tsuka, and the Tsuka-ito was cut in the midst of a battle. 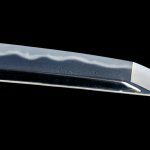 This is a result of the careful considerations and wisdom of the craftsmen of feudal Japan, to allow the users of their swords to continue to battle even if the Tsuka-ito was cut during battle. 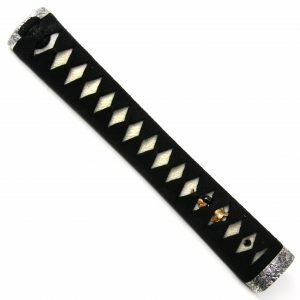 If the Tsuka-ito is wrapped without alternating at the folds, the Tsuka-ito will unravel easily and your life might be lost. 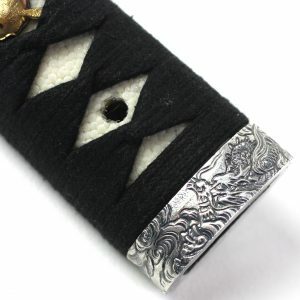 Menuki have a proper direction and Tenchi (top/bottom) which should be correctly mounted on the Tsuka before it’s wrapped. Having the Tenchi (top and the bottom part) of the Menuki reversed is unthinkable and a total lack of skill and understanding on the part of the craftsman. 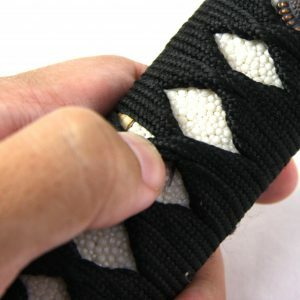 Although there is no specific rules, the craftsmen needs to take into consideration how the Menuki will look when the sword it’s sheathed and hangs from the waist of the practitioner, having a Menuki that looks like it has been reversed in this position will affect the appearance of the user. 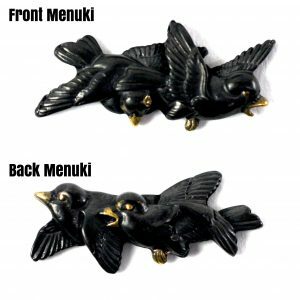 There is a lot of different styles and types of Menuki, so it’s hard to say that the following rules applies to all of them, but in general the following rules should be respected when mounting Menuki. 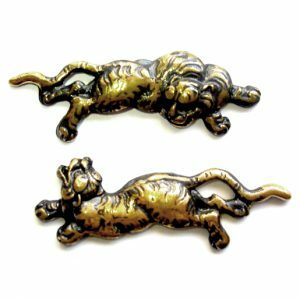 For animal type Menuki: The head or body (in case the animal is facing one direction, but the head is turned around to face the other direction) of the animal should be in the direction of the Fuchigane. 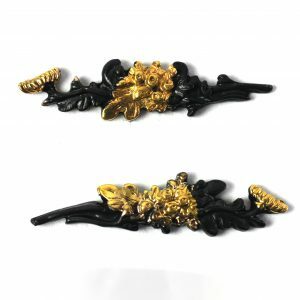 For plant type Menuki: The roots or the stem should be in the direction of the Fuchigane. This is a pair of Tora Menuki, The one on top is the “Omote Menuki” (front side Menuki) and the one on the bottom is the “Ura Menuki” (back side Menuki). Please note the general direction of the body, even though the head of the Tiger faces the opposite direction. This is the general rules for when mounting Menuki. 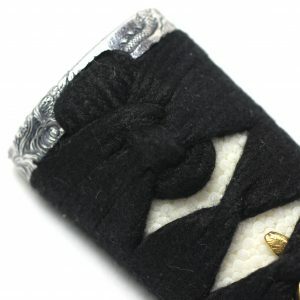 If the Menuki is mounted in reverse, it’s called “Nige-Menuki” (a Menuki that runs away), and this was very disliked by the Samurai warriors as it would imply that they would rather run away than battle to the death. Of course, for Menuki that depict geometrical shapes or non-organic objects for example, these rules might not always apply. When the Menuki is properly mounted, the head of the catfish on this Tsuka faces the Fuchigane. 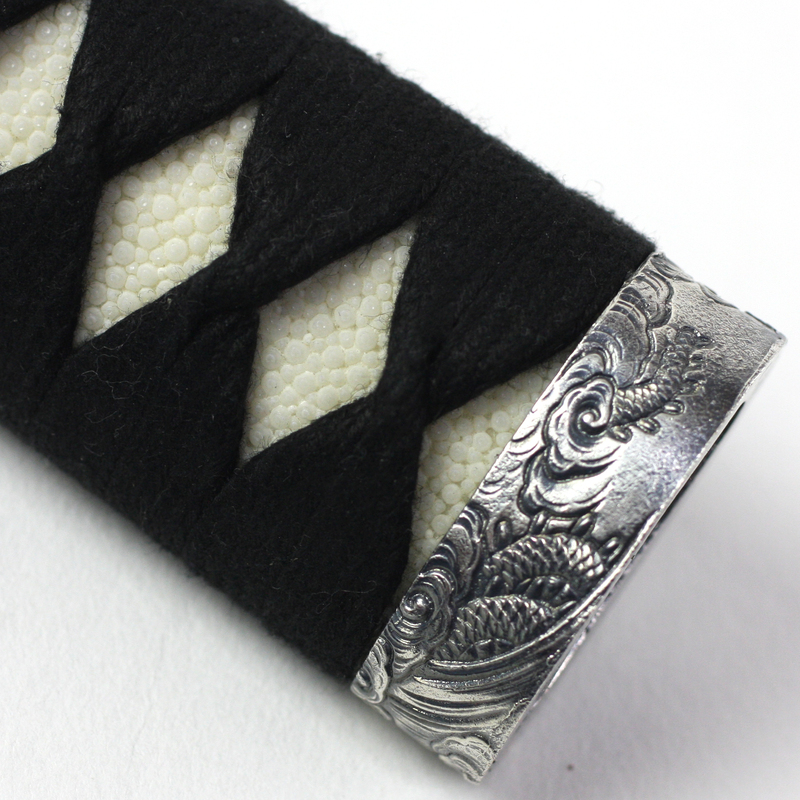 In many ways, the Tsuka is an important factor to the appearance of a sword. 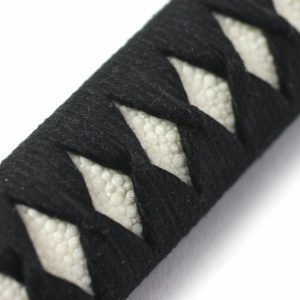 If the Tsuka is not made properly it will result in a less dignified appearance of the user, and also practically hinder his progress as a martial artist. 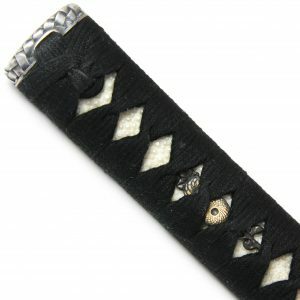 If you look out for the points above, you should be able to tell a good Tsuka apart from a bad one to a certain extent. 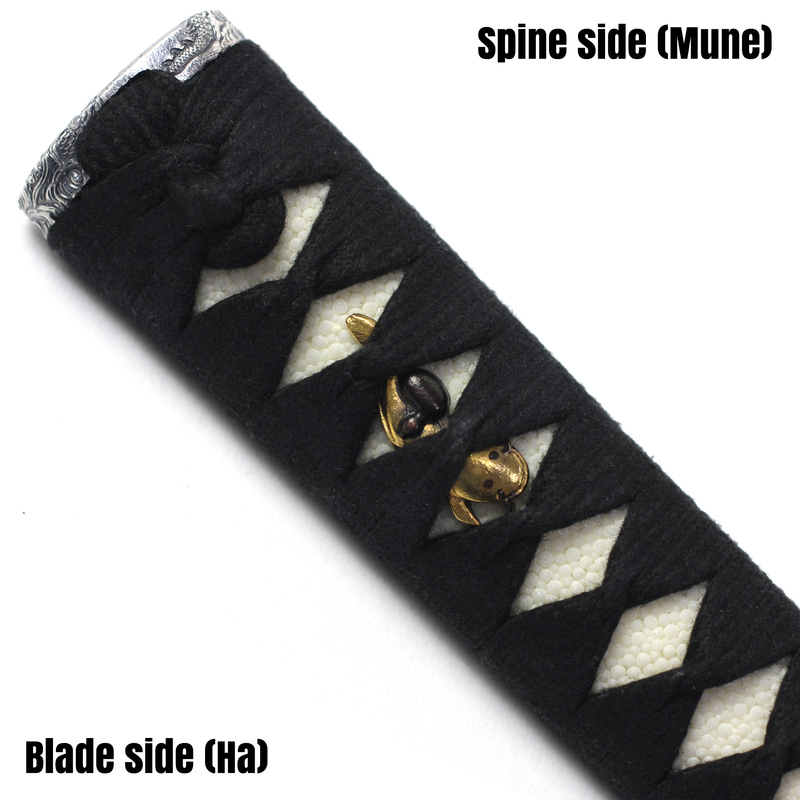 So please use this guide as a reference when you buy your next sword. 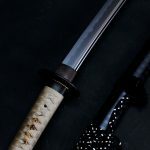 Having said this, no matter how good the Tsuka has been wrapped, if you use it incorrectly, any effort on choosing a sword with a properly wrapped Tsuka will be wasted. 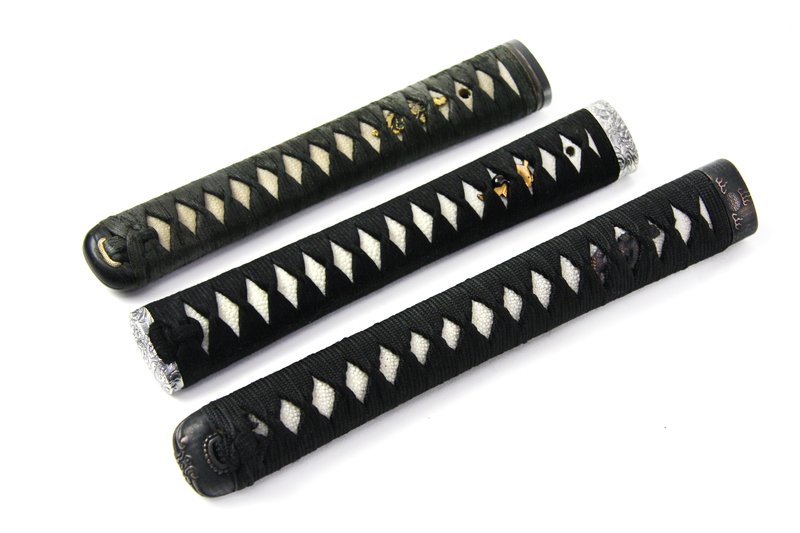 Do not leave everything to your strength, you need to have a proper Tenouchi when you grip your sword. 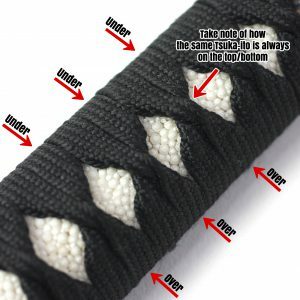 This say the Tsuka will also last longer, and when your Tsuka becomes damaged or loosens even though you have used it the correct way, please do not continue using it and consider to ask to have it re-wrapped. We craftsmen needs to do our best to keep the users safe by making products that are safe to use. However I think that the user also has a responsibility to practice common sense, and should not continue to use something that has already been compromised in some way. Practice safely, do not use Iaito that have been compromised in anyway!